OK, SEMA is over. And we are already back in Germany. But it is never too late for ultra slammed mini trucks, imposing restomods and awesome hot rods. Just hit this link to see what we brought back. Some may have already seen our article ("SEMA Show Las Vegas 2010: Vorbildliche Kulturpflege") on Chromjuwelen.com. Our colleagues from autobild.de posted our coverage as well: "Tuning-Meisterstücke in Las Vegas". We also just received a call that GRIP, a German TV Motor Magazine, covered us working. Check out Min. 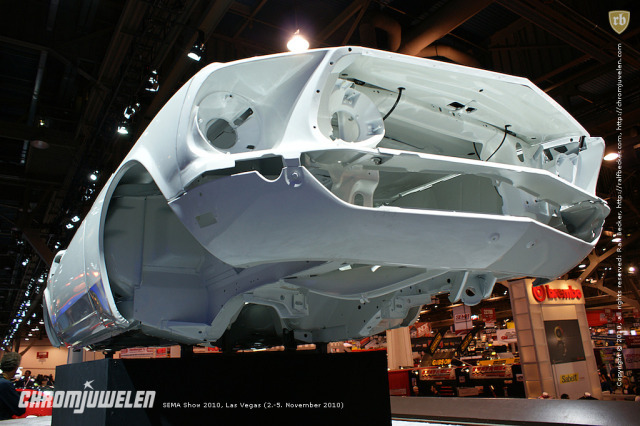 6:20 in their "SEMA Show 2010 report". What a coincidence! At this moment we are working on our reportages about the OPTIMA Ultimate Street Car Invitational, our test drive at the Lucas Oil Off Road Series and our interview with Alex Anderson (West Coast Customs (LA)). Stay tuned. What a mindblowing trip. A huge "thank you" to our partners from Continental for letting us go out into the world. Wow. We love our job. Did we mentioned that already? Yes. We are still alive. We are back from our overseas trip and brought along a ton of material — SEMA Show 2010, Lucas Oil Off Road Race, OPTIMA Ultimate Street Car Invitational, West Coast Customs (Los Angeles) — which wants to get chopped. Aside from that we visited the Las Vegas Motor Speedway for some oval track sports and dragracing and finally paid Rinkens a visit. I bet it will not get boring the next days. Stay tuned. SEMA Show 2010. We will be there. Soon we will be back on the road again—we will visit the SEMA Show in Las Vegas. Also we will attend the Lucas Oil Off Road Racing. Yepp. We are hooked on desert racing. Just shoot us an e-mail if you want to meet us!